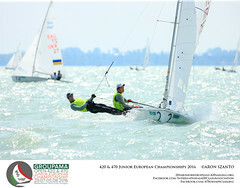 The 2016 420 and 470 Junior European Championships will take place from 29 July-5 August at Balatonfüredi Yacht Club, on Lake Balaton in Hungary. Balatonfüredi Yacht Club is one of the oldest sport clubs in Europe established in 1867 as Balaton-Füredi Yacht Egylet. Since its formation, the club put strong emphasis on competition and takes pride in the education and formation of young sailing talents. Most of the members are currently active competitors. The club is located on the northern shore of Lake Balaton. Balatonfüred is a small town with a population of 13,500, but the number of permanent and temporary inhabitants reaches almost 35,000 during the summer high-season, in July and August. It is an ancient settlement which was already inhabited during the reign of the Roman Empire. Balatonfüred is the touristic, cultural and sailing centre of Lake Balaton. A variety of accommodation is available within walking distance and within a large price range (from EUR 20): large camping site within 1 km, plenty of small and large hotels from 1 to 4 start range, private accommodation in large numbers - take a look at www.byc.hu/en/content/20100429/accomodation. For camping with your tent or motor-van, or bungalow-type accommodation, you can contact Füred Camping which is within 10 minutes walking distance from the regatta site.